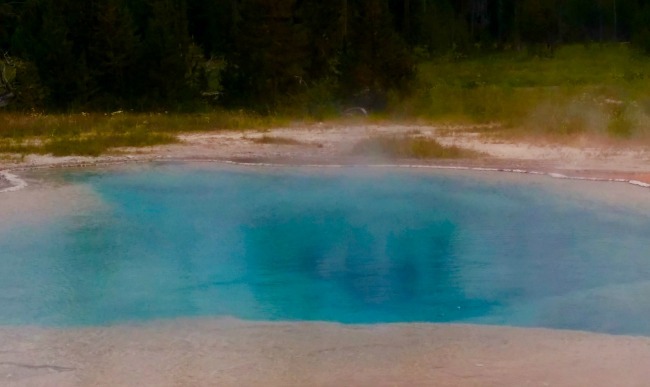 Continental Divide Trail #15: Yellowstone! From Togwotee Pass through Grand Teton National Park and Yellowstone, we’ve met wonderful people and seen amazing sights. Here I pick up Porter, as well as thru-hiker David Breinke (trail-name Problem Bear), at a trailhead for rides to their respective resupplies. 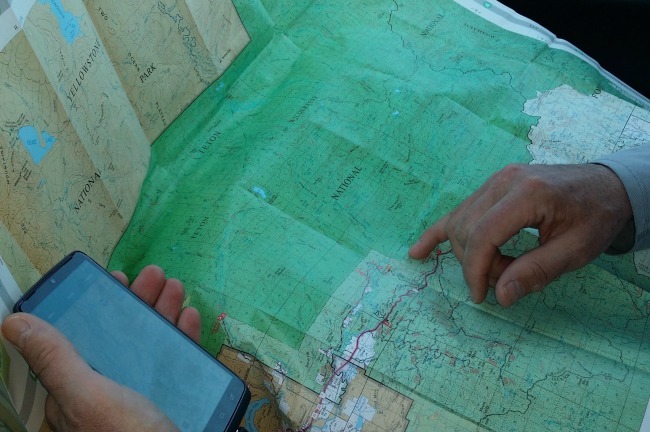 Porter plans his hiking route through Grand Teton and Yellowstone National Parks. 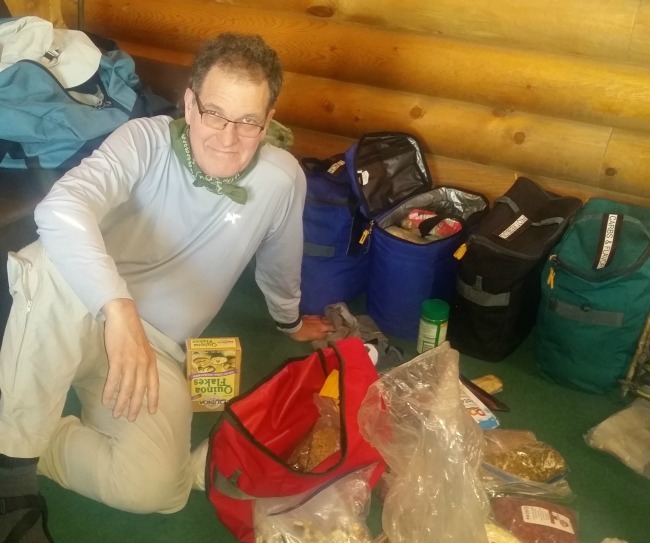 He goes through his bags of resupplies to repack his breakfasts, lunches, snacks, and dinners, almost two pounds of high-energy healthy food a day for the next several days. One of our favorite parts of Yellowstone was the Black Sand Basin, with its geothermal pools, hot springs, and geysers. 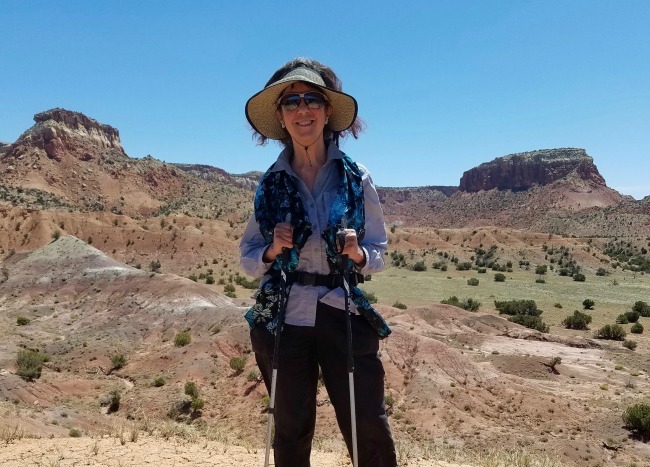 Continental Divide Trail #3: The Adventure Begins! Continental Divide Trail #32: Too Light in the Collegiate Peaks! GDMBR #3: Snow in the New Mexico Desert! 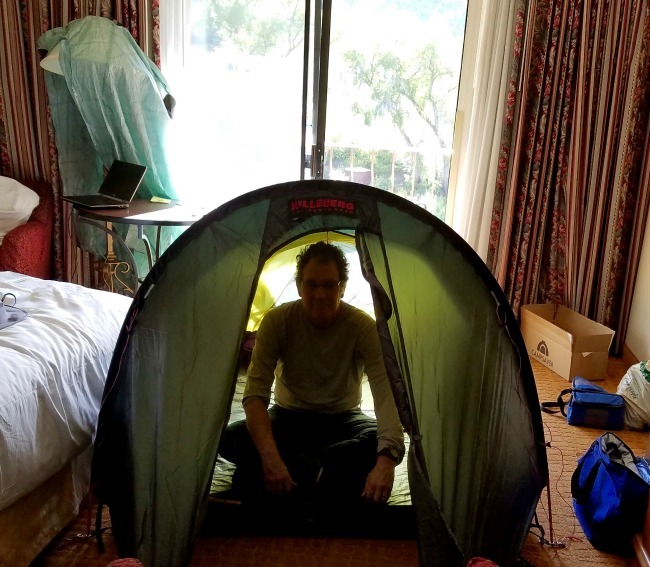 The Making of a Thru-Hiker, Part 6: Who’s Out There Besides You? Gail and Porter, it’s good to know of your progress, and a pleasure to see photographs from the Teton and Yellowstone area. It’s also good to see that Amber is dialing back on her risk-taking (that riding in a bear’s mouth thing was scary!). Best of luck to all of you as you continue your adventure. Thank you, Frank! 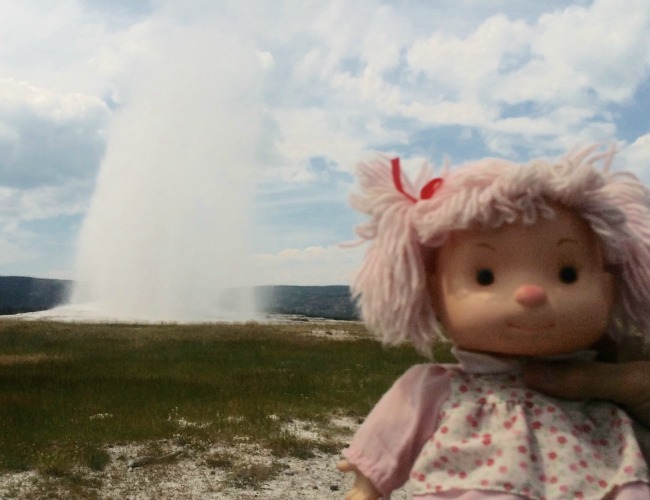 And as for Amber, she’s convinced there’s a little person underneath Old Faithful pushing a button to make it go off every ninety minutes. Andrea, great to hear from you, and that our aqua class has grown–I look forward to meeting the new people in September and seeing you all! We did visit Jackson Hole and the antler park downtown, it is amazing. So glad your knee and hip are doing great! I love following your progress along the trail. Glad that you are seeing the Tetons and Yellowstone from the trail!! Love that area! Climbed Teewinot and the Grand with my dad when I was in junior high school. Camped as a child with family when the bears were fed each evening at the garbage dump. Glad times have changed! I have taken many of my own students from Montana days tent camping in Yellowstone with buffalo meandering around our tents. We survived. You all look to be surviving. Happy continuation! Great Parks!! Will you come back to do Colorado now, or go on through Montana! Pat, love hearing of your own adventures here! And we’re going on through Idaho and Montana next. I’d say thrive–not survive, for sure, in every way. I love following along, but not being there physically. Marian, we’re grateful for all you do in your own spheres of influence! And thank you for welcoming the new BMWs! Problem Bear is an interesting name. I wonder what kind of problems? 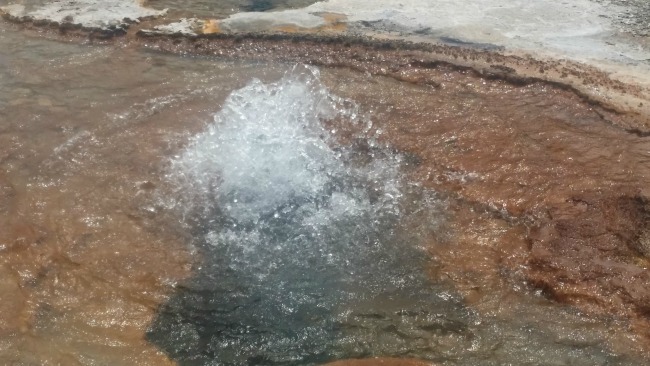 I love the blue pools and passion in the geysers, hot springs. By the time I get to Amber’s ‘Hotcha Mama,’ I think, Gail IS the Hotcha Mama. Thanks for another share of beauty, endurance, and fun. Has seeing the hot springs given Amber any ideas of soaking in a hotel hot tub? LOL Andrea, not to mention the Jacuzzis in a couple of our hotel rooms! WOW! You guys are making progress and seeing some sights. Amber, of course, charms everyone. I’m pretty sure Old Faithful blew just for her!!! Thanks, Jerrie! I just dropped off Porter at a trailhead on top of a mountain and saw fabulous views on my long way down. We’re starting Idaho, with Montana to come after that. I’m astonished at how different each state is from another. Brenda, Amber says thank you very much. Any gray in her pink hair is dust! Who’s that trying to strangle Amber?!? Oh Pat, I am ROTFLMAO at your comment! I’m so happy you picked up on that! No one knows what I have to go through to get Porter to hold up Amber for her selfies! Gail – I am at Hill’s Lodge at Priest Lake, Idaho right now. Look forward to Porter’s progress, with your and Amber’s key support, as he makes his way through Idaho and Montana. Joy, how wonderful that you’re at Priest Lake! I see from googlemaps that it’s a seven-hour drive from Lima, MT, where I drive today, otherwise I’d suggest we meet for dinner! Hope you’re having a fabulous time. I’ve loved Angler’s Lodge in Island Park, ID–right on Henry’s Fork of the Snake River. Gail and Porter, we are all thinking of you here at Kaiser! 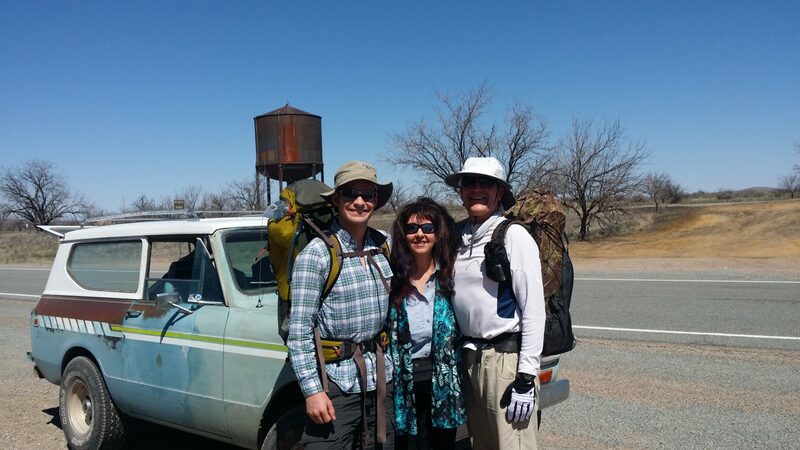 Wanted you to know that Dan Johnson and family are leaving today to hike backcountry in Yellowstone for the next week – in case you see ANOTHER tall guy in the woods. Of course, he’s no good if you have an injury, but nice to know you have friends in the neighborhood. Thanks, Lise, wonderful to hear from you! What fun that Dan and family will be hiking in Yellowstone. Sorry we missed them–we’re starting the Idaho sections. We think of you all so often! Good to see you all looking so well and not having to camp in the snow! So true, Linda! Yellowstone was hot with lots of bugs, and lots of rain the section he’s hiking now, but tomorrow I pick him for resupply in Lima, MT so he’ll get a chance to dry everything out. We think of you all so often! 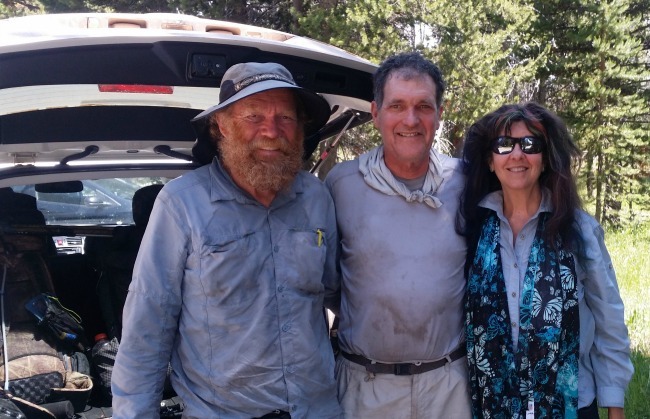 Gail, let me know when you’re homing in on the Big Hole, MT, and then Chief Joseph Pass, and I’ll become the Trail Angel’s Trail Angel!!! And Chief Joe is a good place to come out for a layover/resupply, and we’ve got the spot and tour guides. Can wait to see you!!! Thank you, dear Kathleen, will do! 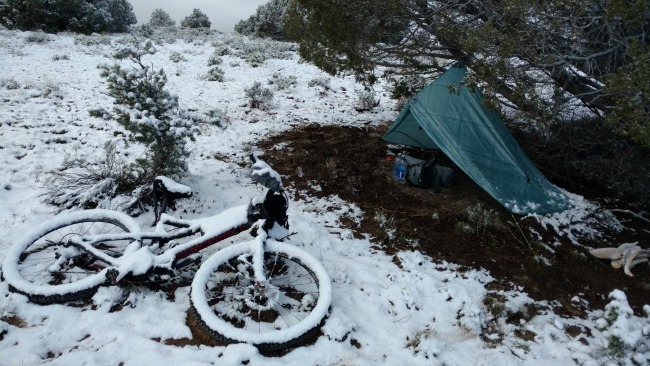 Good for you for working on establishing a local bicycle camp for touring cyclists! Thanks, dear Kathleen, will do! Good for you for working to establish the cyclists’ touring camp! P.S. Think about putting a button at the top of your blog to the effect: Follow Us From the Start. I keep wanting to hook up new folks. Hi Dean, great to hear from you! Porter plans to hike the Colorado section of the CDT next summer, since by the time we make it to Canada this year (September) there won’t be enough time to hike Colorado before the snow flies again. Now should be a good time for you to hike it, though. You might want to sign up for the CDT 2015 Facebook private group, lots of good info there. Hope we get to meet you another time! 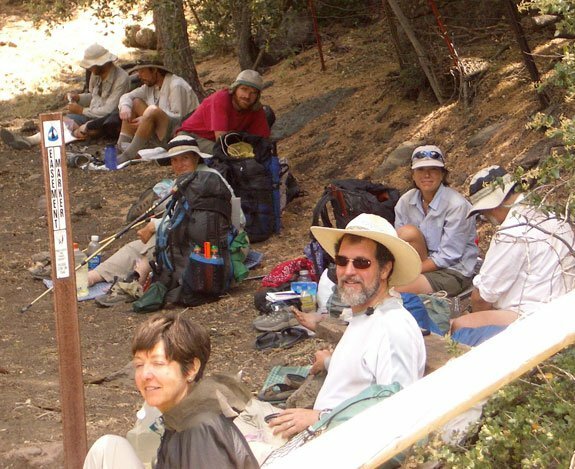 We are a pair of East coast hikers that would like to hike for 7-10 days on the CDT in early June. The whole trail offers us a completely different experience from the AT. Given that many days in June where would you recommend? Hi again, Bob, just checking to make sure you got our reply, now that we have access to my computer: We suggest central New Mexico or southern Wyoming then. Too much snow most other sections. We’re on a yoga and snorkeling retreat in Mexico now, could you let me know if you got this? Thanks! Hello Gail … Sounds like you are in the right place. When would you think that the Grand Teton trail would be snow free (or close to it)? Hi Bob, on an average snow year, the Grand Teton trail might be fine by mid-July. But the Park rangers will be able to give you a better idea by summer. You might also be interested to know that there’s a private Facebook group for CDT 2016 hikers (section and thru-)–would you like me to submit your email to get you into that? Lots of ongoing great info and you can ask all kinds of questions. Yes please do submit my email. It seems that we are going to have to adjust our dates to July or August. Hi Bob, I submitted your email to the Facebook CDT 2016 page, but it said you had already been invited to join the group? If that didn’t work, feel free to friend me on Facebook and I’ll submit your name instead. Gail … I joined CDT16. Haven’t posted any questions yet because the posting have been feeding me enough info for now. Thanks.